Buying costumes for the kids for Halloween has become a pretty expensive undertaking. It is easy to spend $30 plus on each child, and even that is probably a conservative number when you consider props, accessories, and makeup. 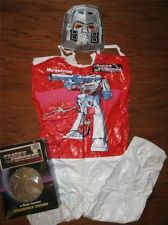 When I was a child, back when there were no cell phones, there was no Internet, and most costumes you could buy included a flimsy plastic mask with string, and some sort of design printed plastic poncho. If you wanted something cool and unique, you had to make it. Well, making costumes for you and your kids can not only save you money, but can also be a fun, and educational project for you and your kids. The Internet has a number of amazing resources to help, with step-by-step instructions available for just about any type of costume or makeup design you may be looking for. Instructables – Every year, the DIY project website Instructables features a wide range of costume instructions, makeup, props, decorations, and even food recipes; all for getting into the Halloween spirit and for the do it yourself driven. Pinterest– Pinterest has become another amazing resource to find costume ideas and instructions as well as just about any other Halloween project that you may be looking to tackle. Youtube – A quick search on Youtube for “Halloween Makeup tutorial” will present a large number of first person instructions on creating and applying makeup to create just about any look you are seeking. Just about any other search such as “Halloween prop” or “Halloween Costume” will provide similar results and a bevy of video tutorials on how to make your own Halloween items. Search Engines – A good place to start with any DIY costume project, is a search engine. No matter which is your preferred search engine, general or specific searches will present any number of available projects from websites across the globe. You may find that creating and working on a costume or Halloween project will not only be fun, but will be a long lasting learning experience for you and your kids. Working with tools, crafts, and fabrics will instill a new appreciation and pride in the kids, while also allowing them to hold their heads up high when trick or treating. The bonding opportunity and experience that you will have by “doing it yourself” will create a memory that will last a lifetime. Get to work! Thanks for the info Frank, and the resources to find it. I really loved Pinterest they have such cool ideas. This is a great post! I will probably start looking into DIY costumes in the years to come as my boys will be older. I think a more simple, cheap costume would be okay for them then. Right now, it’s just easier for me, and they like cartoon characters and superheroes, so I figure, why not? I love DIY costumes and Pinterest has so many ideas for them!